STREEM-InGaN is a specialized software tool for modeling the characteristics of (0001) III-Nitride device heterostructures grown by MOCVD from conventional metal-organic precursors (TMIn, TMGa/TEGa, TMAl) and ammonia, diluted in H2/N2carrier gases. STREEM-InGaN focuses on an InGaN-based active region which implies a sequence of quantum wells and barriers as well as other stages in-between. Layers grown prior to and after the active region can be added into the simulations as well. stress relaxation via formation of V-shaped dislocation half-loops, annihilation of the threading dislocations, and evolution of the strain, threading dislocation density, and indium composition profile can be studied with the STREEM-InGaN software, depending on the particular parameters in the recipe. Figure 1. Schematic view of the structure (a) with and (b) without strain balancing underlayer. 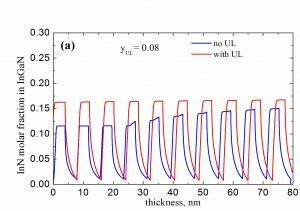 As a result of the modeling, the user can analyze such characteristics as the growth rate and composition profile across the heterostructure and the distributions of strain and dislocation density. By adjusting the recipe parameters, including temperature, pressure, flow rates of the precursors and carrier gases, as well as the sequence and durations of the particular stages of the process, the user can follow the respective changes in the above characteristics and establish correlations between the recipe and properties of the heterostructure. Experiment: D.M. Van Den Broeck et al., Appl. Phys. Lett. 105 (2014) 031107. 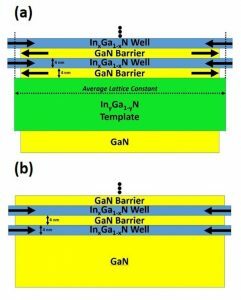 The use of InGaN underlayers (UL) and InGaN/GaN superlattices is now actively exploited during the growth of III-Nitride LED structures for strain balancing in the active regions of heterostructures. Addition an InGaN layer under the MQW stack was shown to improve the efficiency of the MQWs. 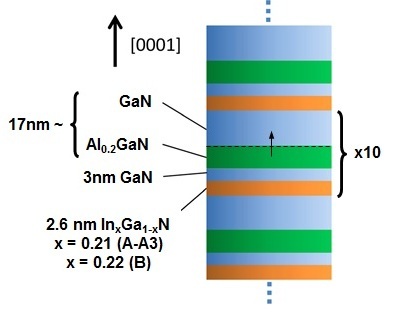 This example considers the growth of so-called strain balanced multiple quantum well (SBMQW) structures consisting of ten InxGa1-xN(4nm)/GaN(4nm) periods grown on 180 nm thick InyGa1-yN UL for x>y. The SBMQW active region implies that x=2y, if the wells and barriers have the same thickness. 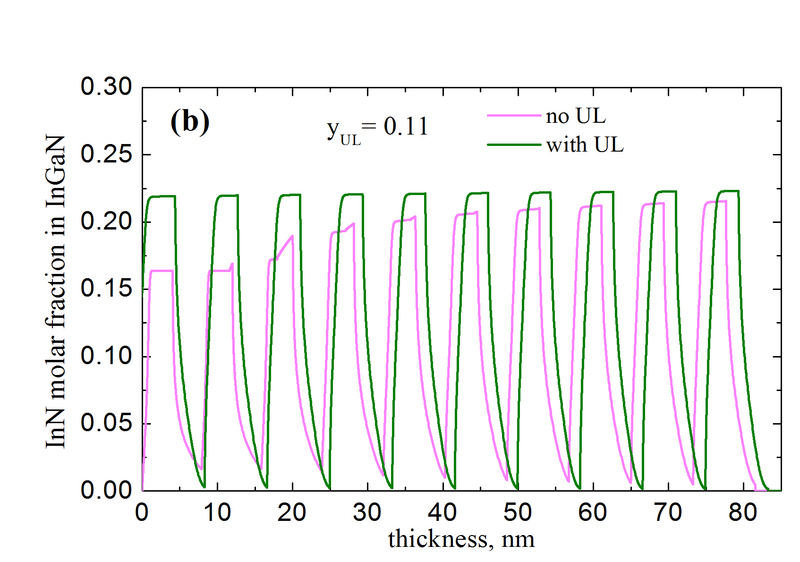 InxGa1-xN/GaN MQW structures with x=16% and x=22% grown on InyGa1-yN underlayers with y=8% and y=11%, respectively, are compared to the conventional structures without UL. 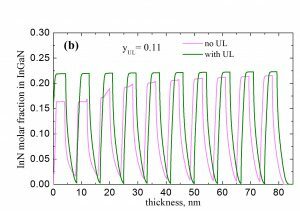 The modeling predicts full relaxation (in agreement with the experimental findings) of 180 nm thick underlayers, which allows the subsequent growth of a ten period MQW structure with about the same indium composition profile across the quantum wells and no additional stress relaxation. In contrast, stress relaxation after several starting QWs, formation of new dislocations in the active region, and changes in the In content distribution in the subsequent QWs are predicted for the structures without UL, as demonstrated in Fig. 2 (a-b) for the active region of the structures with different indium content. These results correlate with the experimental data on PL spectra (see Fig. 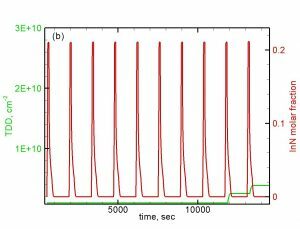 3): a red shift in emission is observed for the 10 period conventional MQW structure, compared to the 2 period one, while there is no apparent shift in the PL spectra when comparing the 2 and 10 period SBMQW. This indicates that the SBMQWs are lattice matched to the InyGa1-yN template regardless the number of periods grown. Figure 3. Detailed view of stress and threading dislocation density evolution during growth of the graded InGaN buffer. 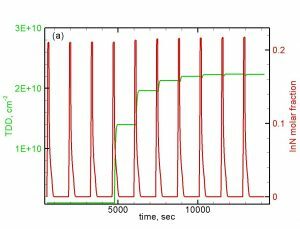 Experiment: K. Lekhal et al., Appl. Phys. Lett. 106 (2015) 142101. One of the effective techniques to improve the emitting characteristics of the InGaN/GaN heterostructures is the introduction of tensile AlGaN layers into the GaN barriers, which compensates for the compressive strain in the InGaN MQWs. 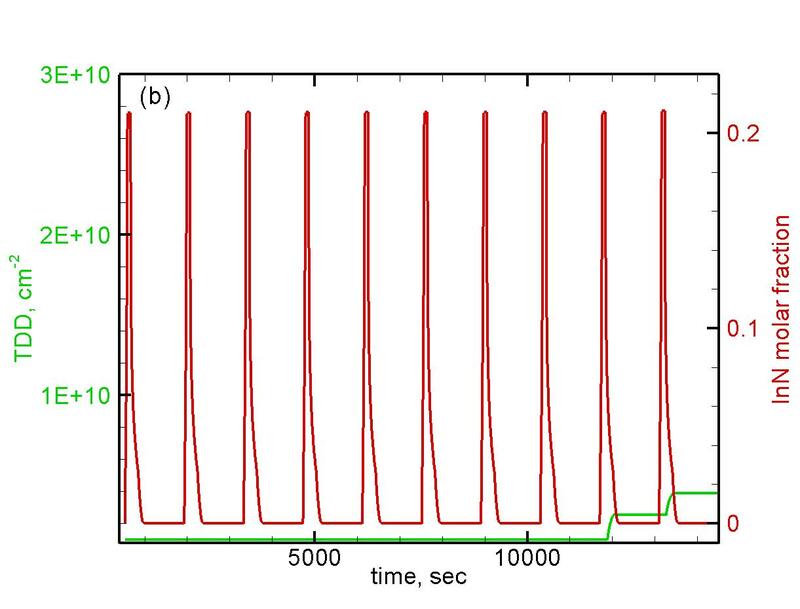 Using this technique, it becomes possible to shift the peak wavelength in the green and spectral area without degradation of the heterostructure quality and with higher emission intensity. The example illustrates how this effect is reproduced with STREEM-InGaN. Figure 4. Schematic view of the MQW structure. The structure under consideration is shown in Fig. 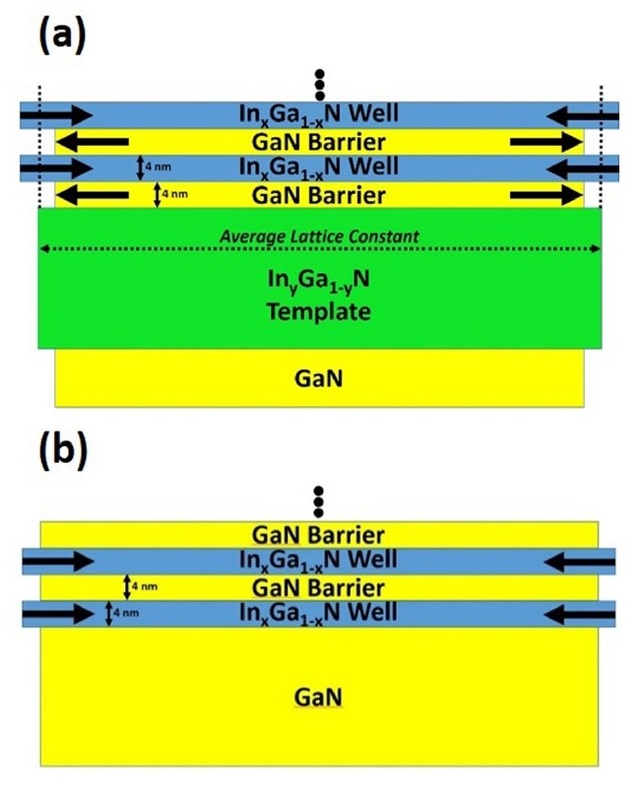 4, while the thicknesses of GaN and Al0.2Ga0.8N in the barriers are summarized in Figure 5. Calculated temporal variation of the threading dislocation density at the growth surface for samples A and A2 are presented in Fig. 6 (a, b) together with the indium composition profiles. Figure 6 (a). Threading dislocation density and InN molar fraction in the active region for sample A. Figure 6 (b). Threading dislocation density and InN molar fraction in the active region for sample A2. Figure 7. TDD and critical number of QWs vs AlGaN barrier thickness. 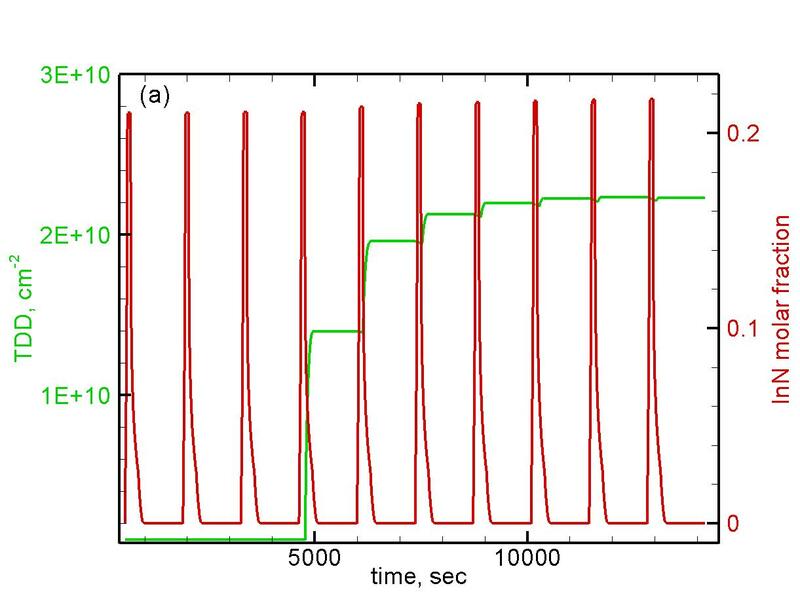 For sample A, the modeling predicts stress relaxation and intensive generation of new dislocations without AlGaN in the barriers, so that only four QWs can be grown with no stress relaxation. 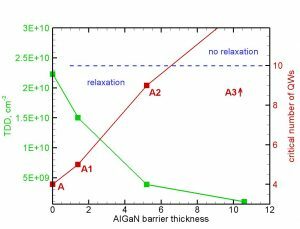 Adding AlGaN into the barriers (sample A2) delays the onset of stress relaxation due to partial compensation of the compressive stress in QWs by the tensile stress in the barriers. The threading dislocation density and critical number of QWs that can be grown without stress relaxation are given in Fig. 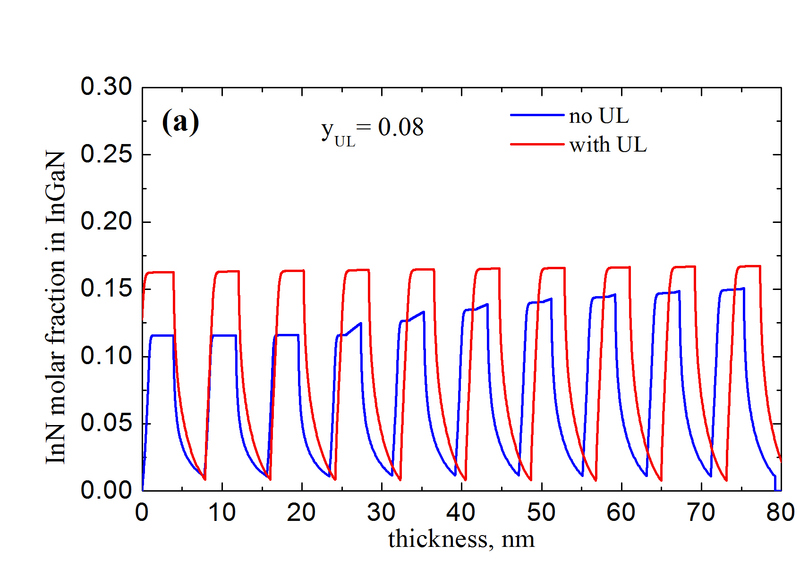 7 as a function of the AlGaN barrier thickness. 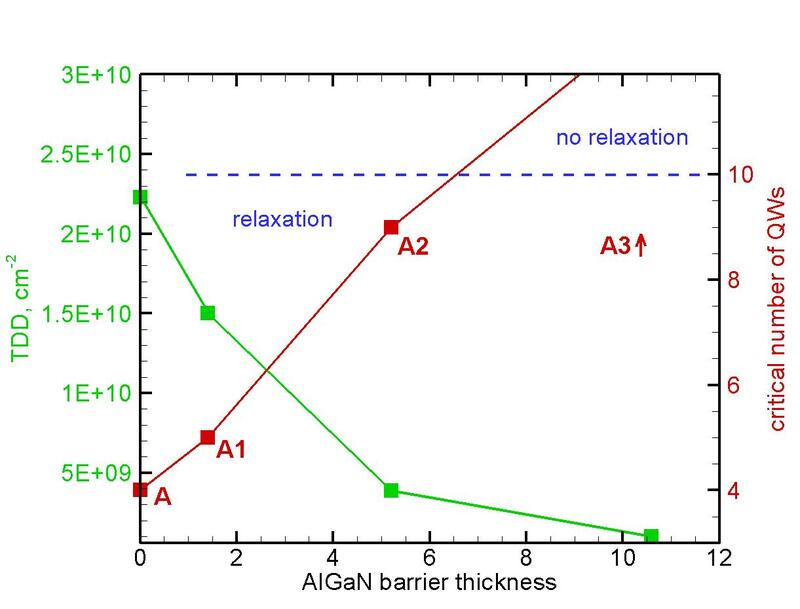 Increase of the AlGaN barrier thickness gradually suppresses mismatch stress relaxation; eventually, no relaxation is predicted for structure A3. This finding correlates with the observed increase in the integrated PL intensity when AlGaN is added into the barriers.